KAMI 2 is a calming and addictive puzzle game developed by State of Play, and it is the sequel to the classic puzzle game KAMI. 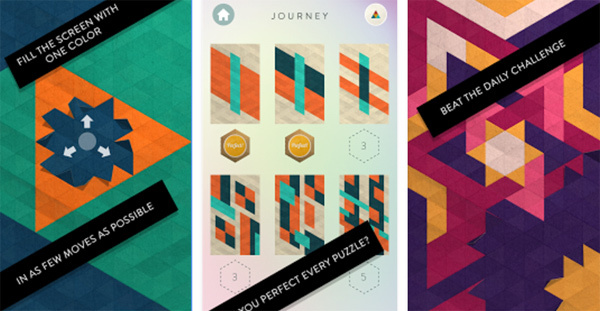 The game takes you on a mind-twisting journey that combines logic and problem-solving. Your objective is to flood each puzzle with a single color in as few moves as possible to claim a perfect sticker. The game features over 100 hand-crafted puzzles, and there are over one million player created puzzles created online. If you get stuck in the game please check out the video walkthrough for the game. This entry was posted in Android Games, iOS Games, Mobile Games, Walkthrough and tagged KAMI 2, KAMI 2 Answers, KAMI 2 Cheats, KAMI 2 Gameplay, KAMI 2 Help, KAMI 2 Hints, KAMI 2 Journey, KAMI 2 Solutions, KAMI 2 Walkthrough by Marvin. Bookmark the permalink.